Kids and adults will have a blast in the All Star Arcade! Featuring 2,000 square feet of modern video and prize-earning redemption games. We’ve packed in over 50 player positions, so get your family and friends together and come play! Now there's a new way to play & pay. 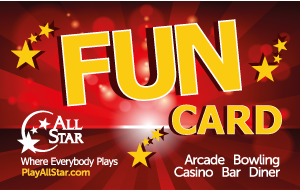 All Star's FUN Card allows you to play all games in the Arcade. Your winning tickets are stored electronically on your card until you are ready to redeem them for prizes. Hands are free and no lost paper tickets. Your FUN Card is reusable. Add credits at any time using the self-service kiosk in the Arcade. An attendant can also reload your card at the Prize Zone counter. 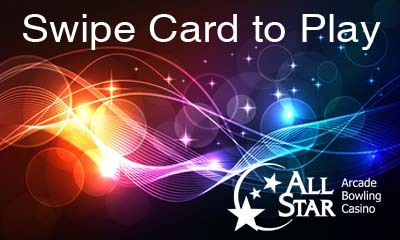 In addition to Arcade play, FUN Cards can be used for bowling, food, and beverages inside All Star. FUN Cards make great gifts. Consider giving FUN as your next gift. Play and win! Redeem your winning e-tickets for fun and funny merchandise. The Prize Zone redemption store features an array of items for all ages and preferences. Select from such items as candy, toys, and neon lights to Seahawks jerseys, an electric guitar, iPod Touch and GoPro camera. 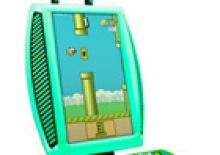 Remember Flappy Bird?! The loved/hated game everyone wished they would have downloaded on their phones before it was deleted from the App Store? We've got the big version in our arcade! Only five were released in Washington and we snagged one! Come check it out and use your FUN Card to play.